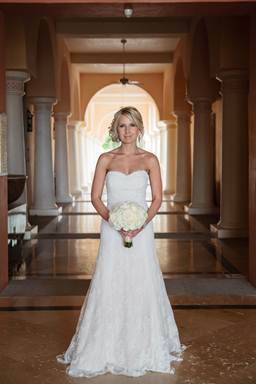 In this week’s hair and make-up feature, we’re excited to share Natalia’s gorgeous wedding-day look from her November wedding at the Hilton Los Cabos! Russian beauty Natalia wore a romantic lace gown with intricate earrings to match. Since we always consider every detail of a bride’s overall look, we styled her bridal hair and make-up around this vision of classic romance. 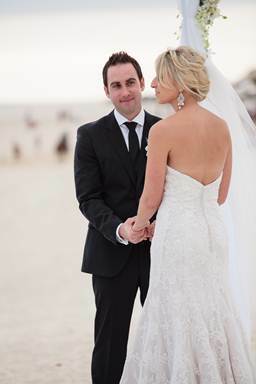 We styled Natalia’s blonde hair into a loose, twisted up-do that paired well with the details of her gown and also showed off her stunning bridal jewelry. We left a few tendrils loose around her face to keep the look soft and sweet. Natalia is a natural beauty, so for her wedding-day make-up we went for a slightly dramatic eye and kept her cheeks and lips more neutral. 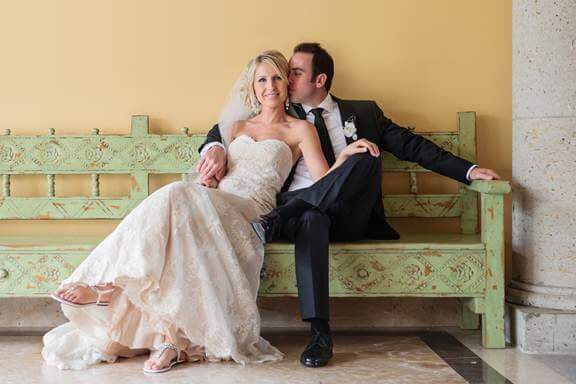 Natalia looked fantastic on her wedding day, and the professional photos by photographer Anna Gomes are proof! A special thanks to the team at Creative Destination Event Company for coordinating this special day! 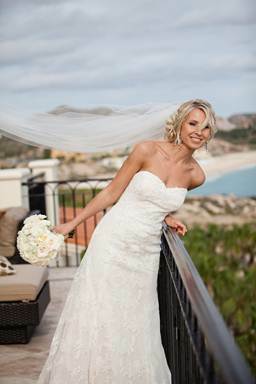 This entry was posted in Cabo Bridal Hair and Makeup and tagged Cabo bridal salon, Cabo bridal spa, Cabo wedding, Cabo wedding hair and makeup, Creative Destination Event Company, destination bridal hair, destination bridal hair and makeup, Hilton Los Cabos, natural wedding makeup, romantic wedding look, Russian bride, wedding updo.